AT WHOSE NAME SHOULD EVERY KNEE BEND? EVERY TONGUE CONFESS? The second reading at Mass this Sunday, September 28, 2008, is the oft’ quoted passage from Paul’s Letter to the Philippians: 2:5-11. Not only oft’ quoted, but frequently relied upon by theologians and other Christian scholars because of its richly compact theological truths. First it tells us, beautifully, about the attitude or mindset which Christ had when He came into the world, His incarnational virtues of humility and obedience; “obedient to the point of death, even death on a cross”. Then Paul transitions to the Father’s wonderful exaltation of His only-begotten Son, “that at the name of Jesus every knee should bend, of those in heaven and on earth and under the earth, and every tongue confess that Jesus Christ is Lord, to the glory of God the Father”. Let’s go back in time, ‘salvation history time’, to the first time when this literally happened. It was nighttime in the hill country outside Bethlehem, two thousand years ago (Lk 2:8-20). The angel of the Lord appeared to shepherds watching their sheep: The angel “confessed with his tongue” the Lordship of Jesus Christ: “…for to you is born this day in the city of David a Savior, who is Christ the Lord”. Suddenly “a multitude of the heavenly host” joined this angel praising God. They were all confessing with their tongues, the Lordship of Jesus Christ. Some paintings of this scene even suggest that these angels in the sky are in a kneeling position. 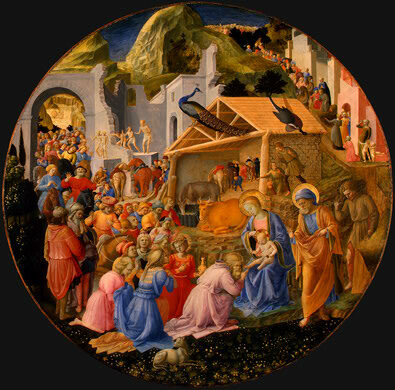 Next, we see the shepherds kneeling around the babe wrapped in swaddling cloths lying in the manger. And they “made known the saying which had been told them concerning this child”. They too were “confessing” the Lordship of Jesus Christ, while kneeling. We can be certain that Mary and Joseph, at least for part of that evening, were also kneeling and confessing the Lordship of Jesus Christ. Later, we hear of the wise men from the East. When “they saw the child with Mary his mother…they fell down and worshipped him” (Mt 2:11). We can join with these Holy Ones of old, God’s angels, Mary and Joseph, the shepherds and wise men, and yes, with St. Paul, bending our knee to the Name of Jesus, and confessing with our tongue His glorious Lordship! But we can do more yet. Every physical action while acknowledging the Lordship of Christ, is likewise, an act of praise, honor or worship. With our eyes we can honor Him! With our hands – even if quietly folded in simple prayer – we can honor Him! With our head – whether bowed low or lifted high – we can honor Him! With our intellect! With our will! With our memory! With our imagination! With our time! Have I forgotten something? Our lives are replete with opportunities to praise, honor and worship Jesus Christ our Lord. On the stairs, in the elevator, on the landing, in the hallway, on the bus, in the parking lot. We can sanctify the world, acknowledging His Lordship! Very nice post. I can’t say enough about your use of beautiful images. This ‘Adoration of the Magi’ is yet another example. We pray for the defense of the unborn. God bless you. We have spent a lot time looking for beautiful images to share but we think it’s worth the time. These images edify us and bring beauty into our lives and so we hope it will do the same for others.